Our best new basic part is BBa_K2638002, copD, an inner membrane importer for copper ions. It is part of our accumulation system in E. coli. In its native organism Pseudomonas brassicacearum 3RE2-7 it is expressed next to copC, which supports effective uptake. Also we have listed all our basic parts on this page. We expressed the copD gene in two different expression systems, one with a T7 promoter and RBS (BBa_K2638004) and the other with a pBAD/araC and RBS system (BBa_K2638006). All results also in comparison with the other importers we characterized can be found on our accumulation results page. 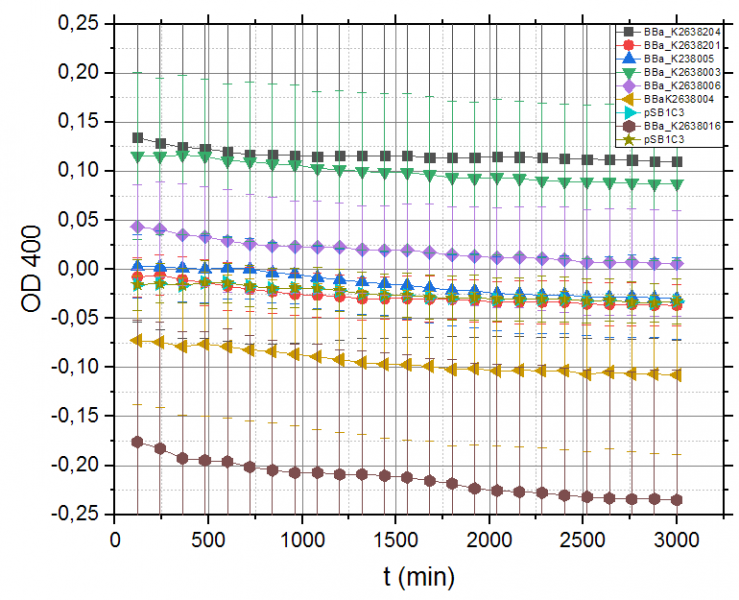 Figure 1: Growth curves measuring OD 600 with E. coli KRX BBa_K2638201 at different CuSO4 concentrations. Left: No induction. Right: Induction started simultanously with inoculation with 0.1 % rhamnose and 0.1 mM IPTG. 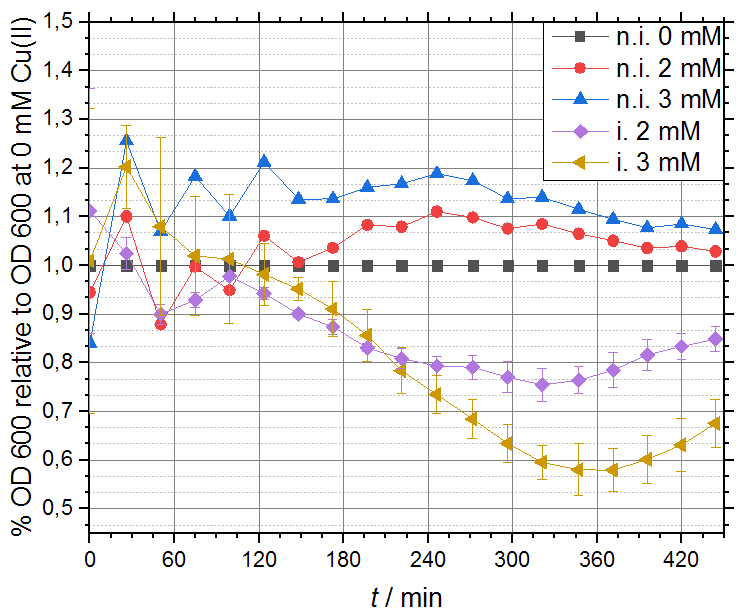 Figure 2: Growth curves of E. coli DH5α BBa_K2638006 at different CuSO4 concentrations. Left: No induction. Right: Induction started simultaneously with inoculation with 1 % arabinose. Using the growth curve data from E. coliDH5α carrying BBa_K2638006 we also compared relative growth of a strain at 2 mM or 3 mM Cu(II) against the growth at 0 mM Cu(II) for not induced and induced cultures (figure 3). The data shows that supplementary copper even benefits growth at low concentrations. At small copper concentrations non-induced cells grow even faster then without added CuSO4 (9.9 % with 2 mM Cu(II) and 21.2 % with 3 mM Cu(II)). Upon induction with arabinose this changes and growth is inhibited by 21.5% ± 3.3% at 2 mM Cu(II) and 42 % ± 5.4 % with 3 mM Cu(II). This is a strong indicator for successful copper uptake. Figure 3: Relative OD 600 of not induced cultures growing with 0 mM, 2 mM or 3 mM supplementary Cu(II) in comparison with 0 mM Cu(II) (n.i. 0 mM, n.i. 2 mM, n.i.  3 mM). The other curves (i. 2 mM, i. 3 mM) of with arabinose induced cultures are compared to cultures grown with 0 mM arabinose and 1 % arabinose. 1-N-phenylnaphthylamine membrane-permeabilization (NPN) assays are a fast method to measure the permeability of outer cell membranes. The NPN assays were all performed under the same conditions. The cells were either induced with 0.1 % rhamnose and 0.1 mM IPTG or with 1 % arabinose. Afterwards, fluorescence was measured in the range from 380 – 550 nm after exitation with light with the wavelength of 355 nm. The fluorescence values for every measurement were normalized to the fluorescence value at 382 nm. In both strains which expressed the copD composite parts BBa_2638004 (T7 promoter, RBS and copD) and BBa_K2638006 (pBAD/araC promoter, RBS and copD) a higher increase in the percental fluorescence increase was shown compared to the pSB1C3 control strain (yellow curve figure 3). 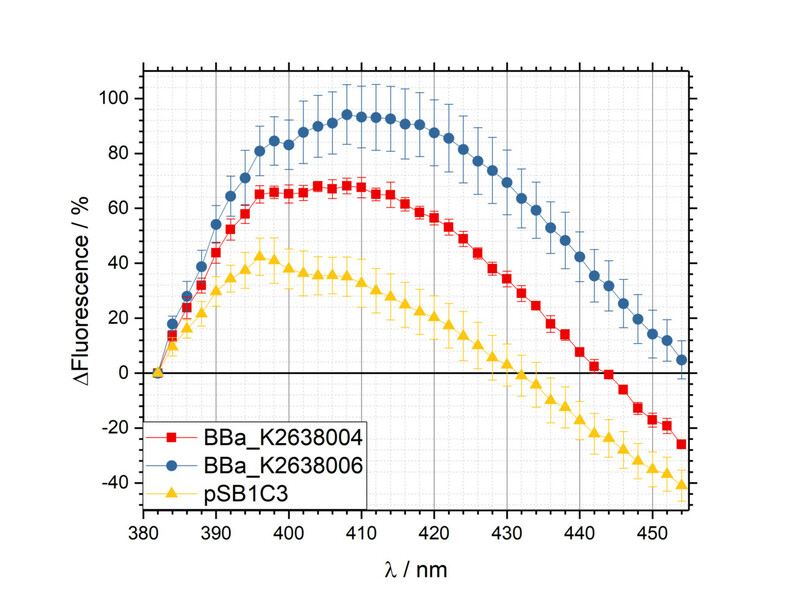 The strain expressing copD under control of the pBAD/araC promoter with RBS (BBa_K2638006, blue curve in figure 3) showed a maximum of 94.16 ± 10.89 % in the fluorescence emission at 408 nm. This is an increase of 59.03 % to the empty control vector pSB1C3. The copD strain with the T7 promoter (BBa_2638004, red curve in figure 3) showed a maximum regarding the fluorescence of 68.10 ± 2.84 % at 408 nm. This is an increase of 32.99 % in comparison to the empty vector control. The difference increased fluorescence at 408 nm of both copD expressing strains compared to the empty vector control show a substantial increased of the membrane permeability of E. coli. This also indicates substantial uptake. Figure 3: Relative fluorescence increase of E. coli KRX strains with BBa_K2638004 (copD containing plasmid with T7 promoter control, red curve), BBa_K2638006 (copD containing plasmid with pBAD/araC promoter with RBS control, blue curve) and as an empty vector control an empty pSB1C3 in E. coli KRX (yellow curve). The excitation wavelenght is 355 nm. The OD600 of cells was adjusted with the NPN stock solution to the same value. The measurement was performed with the Infinite® 200 PRO in a 24 wellplate with flat bottom (Greiner®). Specifity of Cu(II) uptake is shown with an ONPG-assay (orhto-Nitrophenyl-β-galactoside assay). The ONPG assay shows no unspecific uptake for copD and the other analyzed constructs (figure 4). Figure 4: Results of the ONPG assay. The absorption spectra are measured at λ = 400 nm over t = 3000 s. The measurement was performed with the Infinite® 200 PRO in a 24 wellplate with flat bottom (Greiner®). In general our data shows that our copper uptake Biobricks work as expected. The import of copper can be shown by increasing toxic effects on cells, as the growth curves indicate an obvious growth inhibition for OprC and CopD. The CopD encoding Biobricks BBa_K2638002, BBa_K2638004 and BBa_K2638006 show the most impressive results both in the toxicity test and the NPN assay. This result was expected, as the import of Cu(II) occurs actively across the inner cell membrane into the cytoplasm (Lawton et al., 2016), where toxic effects have the strongest impact. Further interesting experiments would be the combination of OprC (BBa_K2638200), CopC (BBa_K2638001) with CopD (BBa_2638002) in one biobrick. The combination of an importer into the periplasm and into the cytoplasm could improve the effectivity of uptake dramatically. To further support CopD, CopC could deliver Cu(II) to the transporter through the periplasm. The already performed growth experiments could be performed and measurements of intracellular copper may be conducted. For our metal resource recovery system we build lots of new biobricks for accumulation and storage of metal ions, toxicity counteractions and nanoparticle formation. We also designed parts for our siRNA expression and analyzation tool to regulate expression of individual genes on RNA level.